Great for hauling landscaping materials! Trailers include D-Rings for transporting skid-steers! Ramps available for loading Bobcats. S185 or smaller Bobcats. Large E 32 Backhoe will not fit. CAN HAUL SMALLER BACKHOE . Truck must have electric brakes, 2-5/16" Ball, & 10,000 lb. Hitch. Inside Dump Box Width - 71"
Inside Dump Box Length - 11'-10"
Trailer Weight - 3600 lbs. Most van hitches are too low. 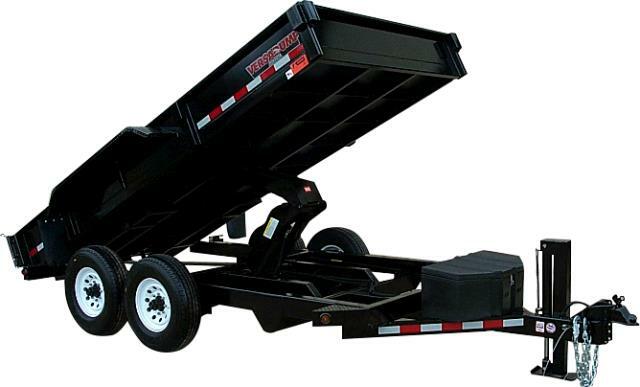 At Hejny Rental, we offer a great selection of trailers - flatbed trailers, dump trailers, tilt trailers, utility trailers, skid steer trailers, covered trailers - for any questions on our trailer rentals in the Twin Cities, please call us today!